Educators and staff at Kingston Beach Education Centre work hard to limit the spread of disease and illness within the care service. To aid this, parents are sometimes asked to keep their child at home (called ‘exclusion’) in the event of illness or disease. 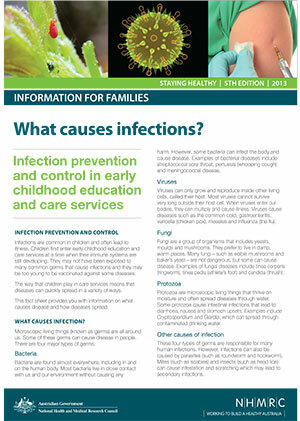 The aim of exclusion is to reduce the spread of illnesses in the care service. The less contact there is between people who have an infectious illness and people who are at risk of catching the illness, the less chance the illness has of spreading. 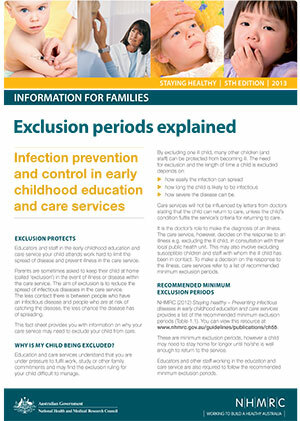 Please click on the documents below to read more about why we need an Exclusion Period, what the different Exclusion Periods might be and to learn more about what causes infections. 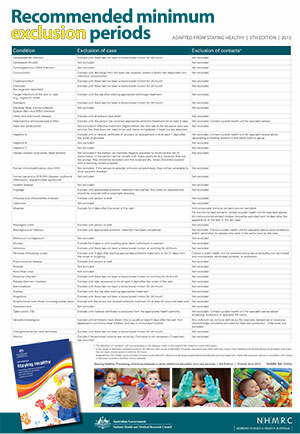 These resources are sourced from the National Health and Medical Research Council (NHMRC), Australian Government. Staying Healthy: Preventing infectious diseases in early childhood education and care services (5th Edition).